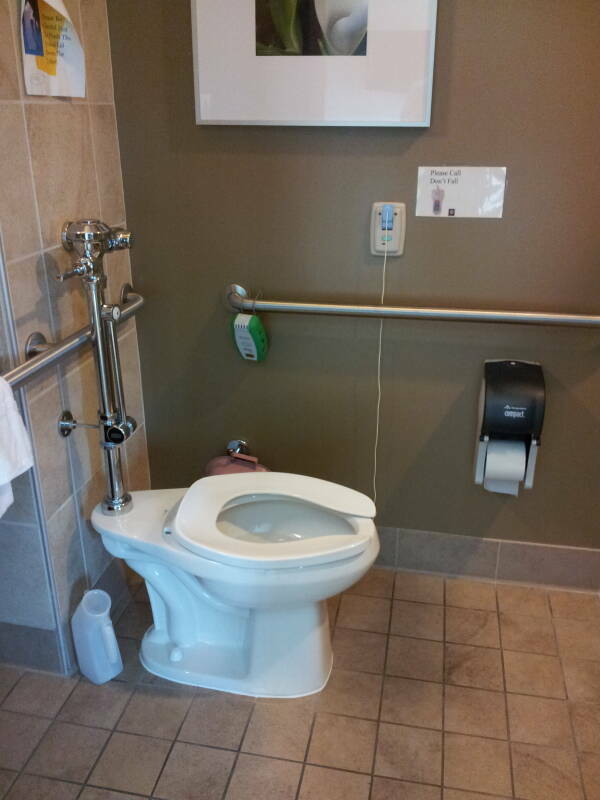 Hospitals and other health-care facilities have specialized requirements for toilets. They must provide elimination for patients who are confined to beds. Those patients need bedpans and hand-held urinals. The next step toward home-type toilets would be a bed-side commode, a portable unit that can be brought into the room and placed next to the bed. These are useful for patients who can get out of bed but cannot move more than a few steps. These units are basically portable toilets, although we will see that the same system can be used in combination with a traditional toilet. 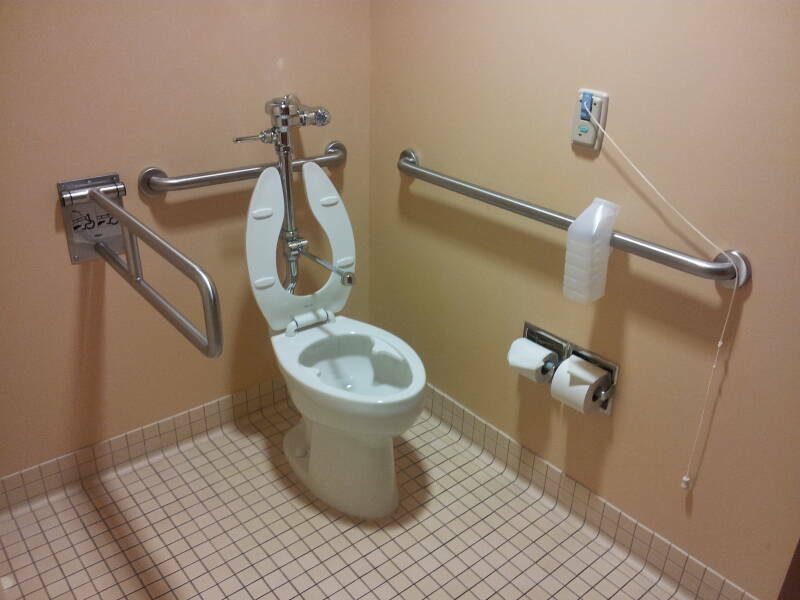 Then there are fairly standard toilets, accompanied by extensive handrail systems for patients with restricted mobility and agility. We will see that these often include attachments used by nursing care staff to clean bedpans, hand-held urinals, and components of the portable toilets. Of course, the portable units can be used in the home. So some of what we will see here are health-care toilets that can be found both in homes and in hospital and nursing care settings. When you say bedpan, most of us think of the shiny stainless steel units familiar from movies, "M*A*S*H", and similar. Large, heavy, cold, and shiny. Modern hospital bedpans are far more likely to be made from plastic. They can be cleaned and then sterilized in an autoclave. But they are far cheaper than the old stainless models, meaning they can economically be discarded and replaced after a number of uses. 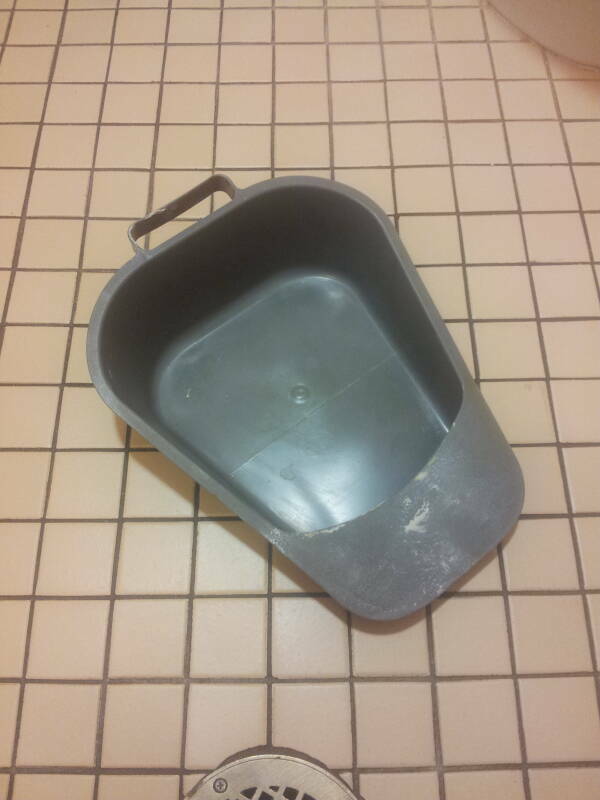 The bedpan you see here is the standard design, made from plastic that can be cleaned in an autoclave. This is a fracture bedpan, used for patients who have fractures of the pelvis or femur or who have had hip replacement surgery. The leading edge is a fairly sharp wedge, making it relatively easy to get it positioned under the patient. That's relatively easy, not at all easy in any absolute sense, but slightly less difficult. Nurses and nurses' aides work incredibly hard in situations that can be extremely unpleasant. 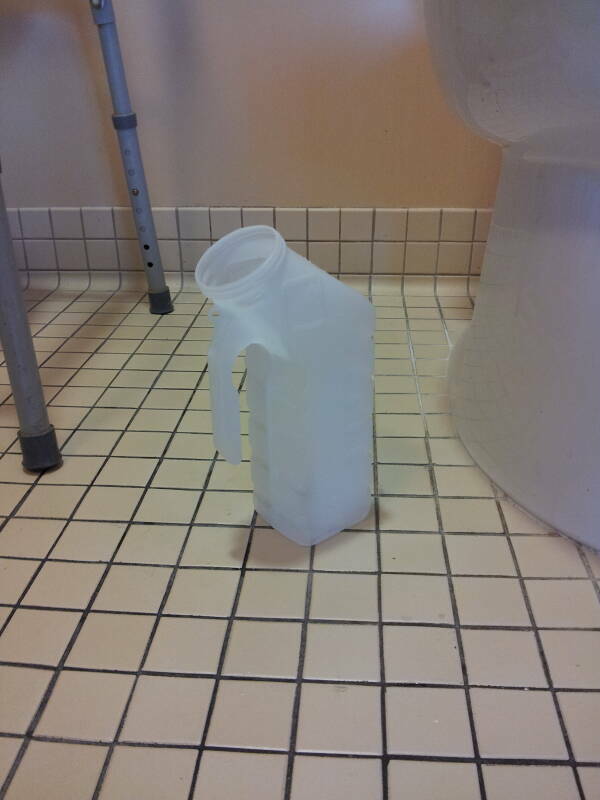 Male patients use handheld urinals like this one, and female urinals are also available. They are marked like graduated cylinders along one side, allowing you to record urine production to an accuracy of 25 milliliters or better. The handle can be clipped over a bed rail or other hand rail for easy and convenient storage. Some even glow in the dark! Who doesn't need a six-pack of glow-in-the-dark pee bottles? 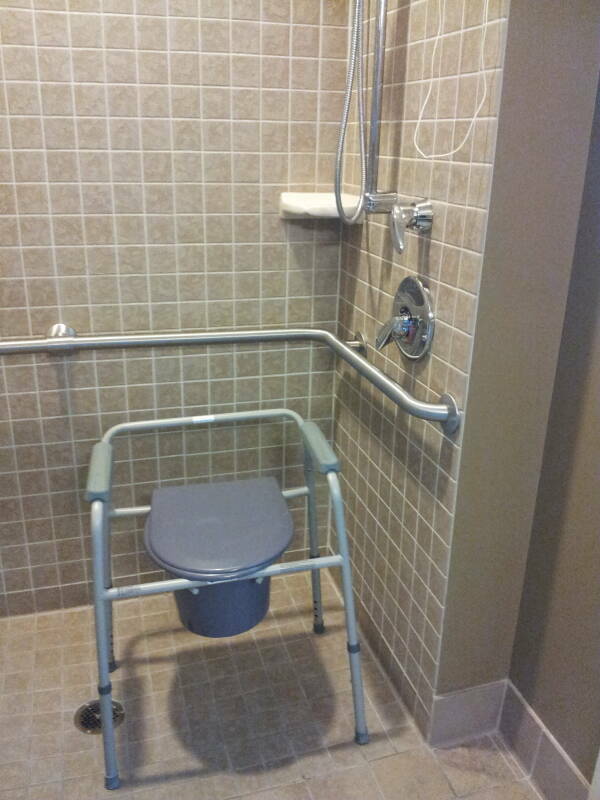 This is the bathroom in a patient room at Jewish Hospital in Louisville, Kentucky. A fairly conventional toilet sits at right, next to a wall. Notice the wall-mounted handrails. One that projects into the room along the other side of the toilet has been folded up against the wall here, you will see it folded down below. At the left in this picture is what's called a three-in-one portable commode. Rails are mounted to the two walls behind and beside the toilet, and one rail has been folded down from its stowage position against the wall. Also notice the call cord above the toilet paper rolls. Hospital bathrooms typically have a "CALL, DON'T FALL" type sign instructing patients to always get help moving between the bed, toilet, and sink. Hospital room toilets usually have an attachment that can be folded down as shown here. When deployed like this, the flush is routed through a spray nozzle on the end of that arm. 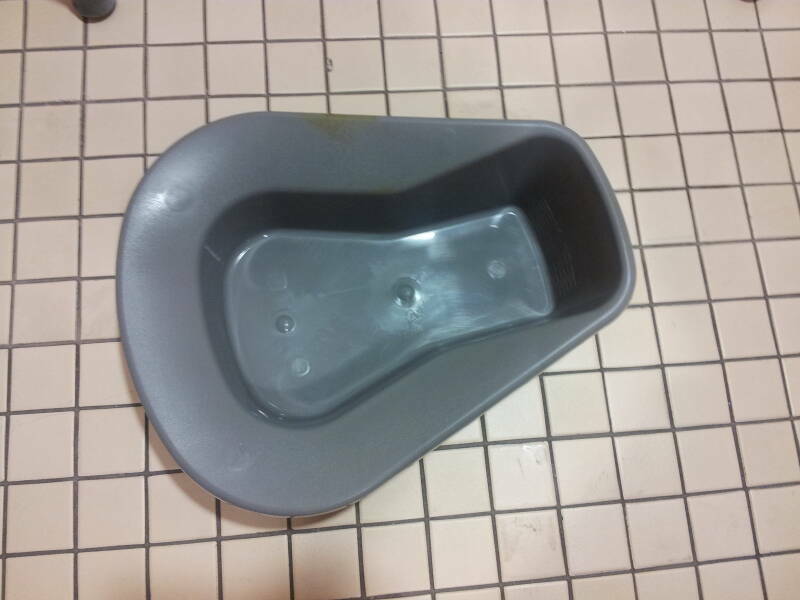 This is used to wash bedpans and rinse out handheld urinals. The bowl of this commode has "horns" on the inside of the rim, more securely holding the bucket from a three-in-one portable commode or a bedpan for safer and more effective cleaning. 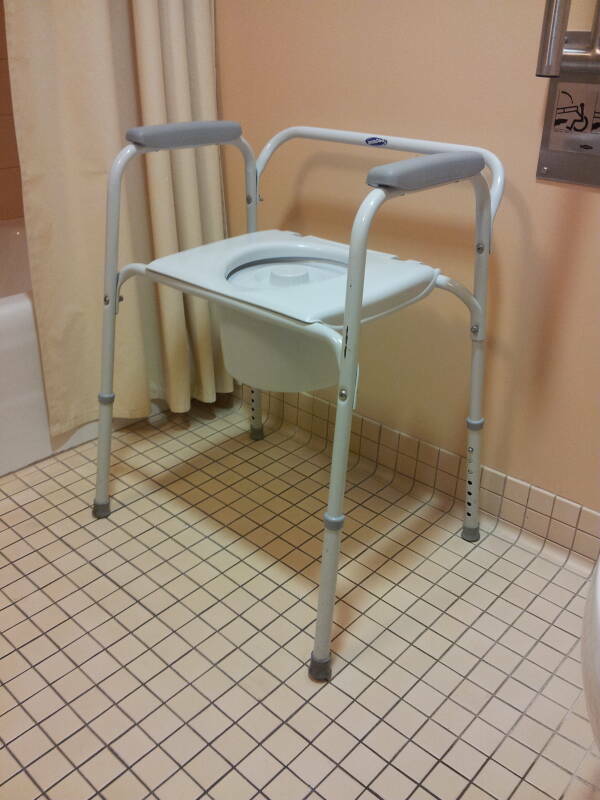 A three-in-one portable commode can be carried into the patient's room and placed right beside the bed. You raise the seat, remove the lid from the bucket, and lower the seat back into place. It then functions much like a standard commode, just without any flushing. The second method of use would be to remove the bucket and leave an open-bottomed tube in its place. You then place this above a standard commode. 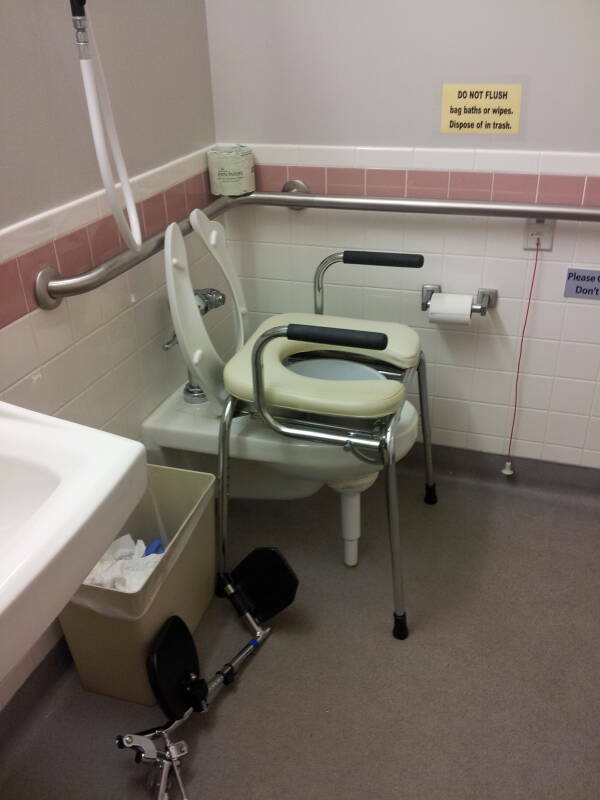 The patient then has a much higher seat, easier to get in and out of, and waste is safely directed by the large tube into the toilet. 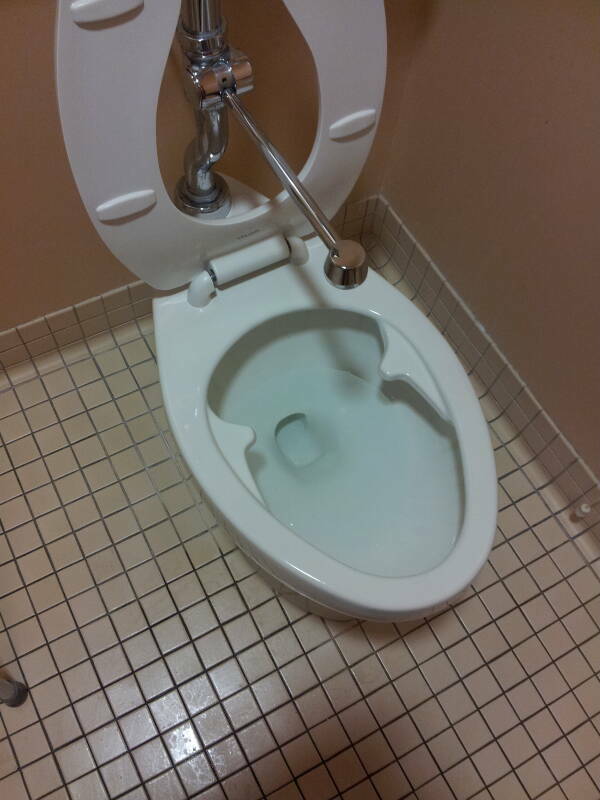 The third method would be to remove the bucket and the waste guidance tube, shortening the legs and lowering the seat so the waste will flow into the toilet bowl as needed. 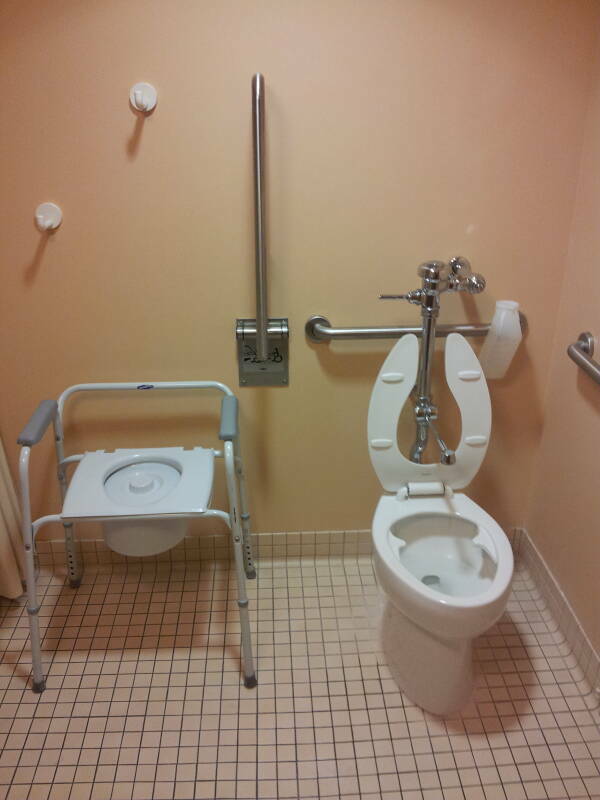 The seat is only a little higher than that of the toilet itself, but the sturdy arms and frame are in place to help the patient onto and off of the seat. Hospital showers will, of course, have many sturdy handrails and adjustable spray heads. I was a little surprised when I first saw a bathtub, but the same bathroom was quite roomy and a large section of it could function as a shower. The entire room has a tile floor draining into a single drain, a very simple and smart design. This rehabilitation facility has toilets and portable commodes and toilet seats very much like those found in a hospital. The device on the floor in the first picture is a left leg footrest from a wheelchair. Much of the bathroom is used as a shower area. 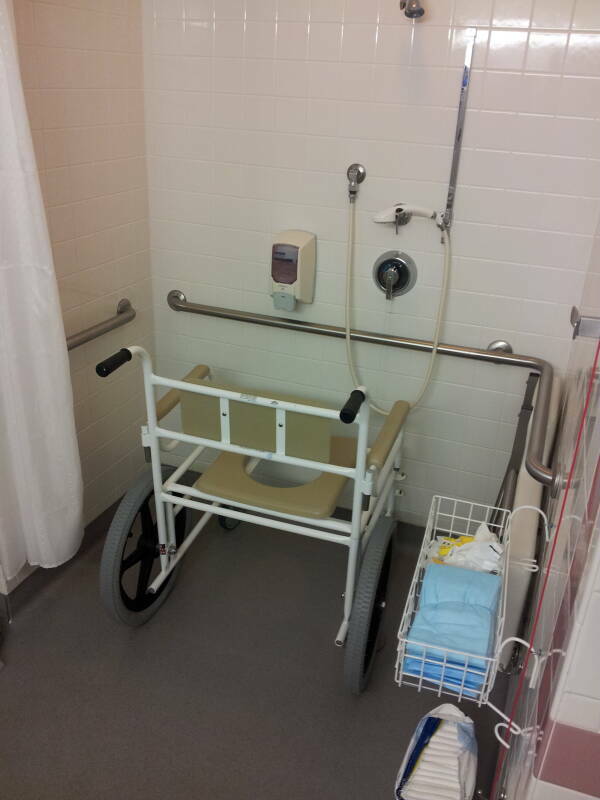 The wheelchair shown here is dedicated to use in the shower, it is quite simple and will not be troubled by being sprayed with or even immersed in water. 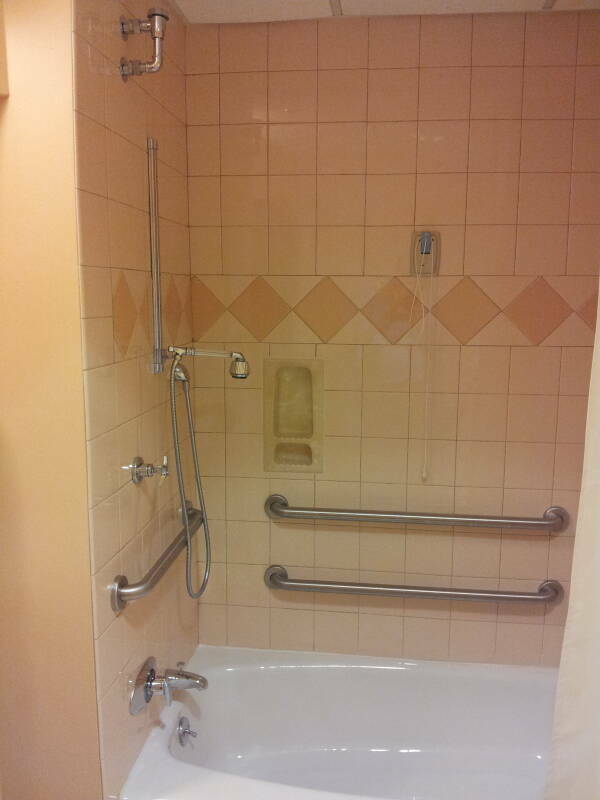 This is the toilet and shower in a patient room in another hospital in the US. The design features are familiar! 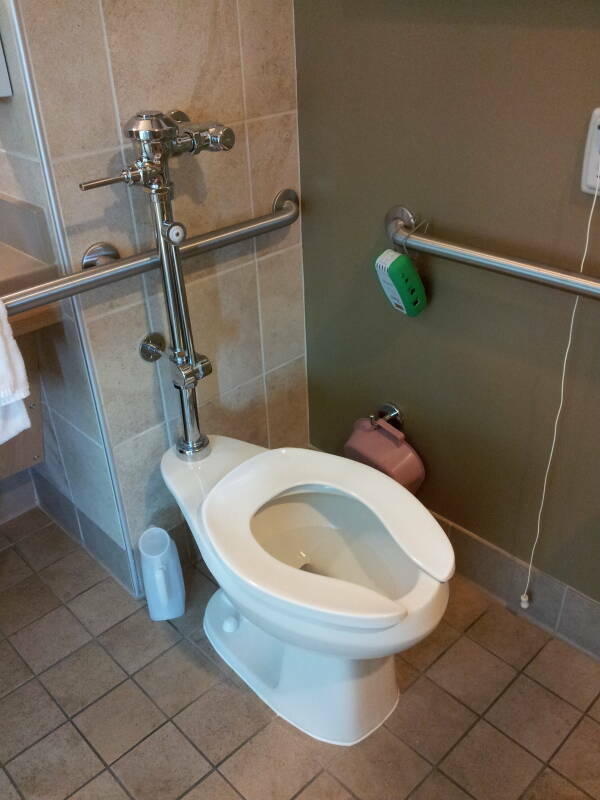 Notice the handheld bed urinal and the bedpan on either side of the toilet. Let's venture overseas. 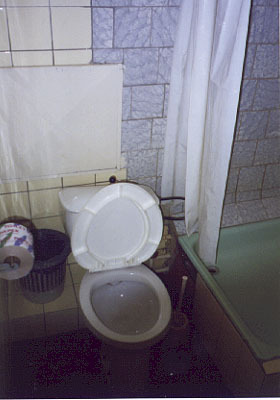 This is the toilet connected to a four-patient ward at Медико-Санитарная Часть Nº 122 на имя Соколова, or Medical-Sanitary Unit #122 "Sokolov", a hospital on the north side of Санкт-Петербург or Sankt-Peterburg in northwestern Russia. USAID had set up partnerships between US hospitals and medical schools and those in the former Soviet Union. This Russian hospital was partnered with Jewish Hospital of Louisville. I worked at this hospital on a number of trips with the USAID project. The open plumbing chase beside the toilet was used by the patients to dispose of empty vodka bottles, newspapers, and cigarette butts. Several plumbing chases had experienced minor flue fires. A postgraduate nursing school was associated with the hospital. 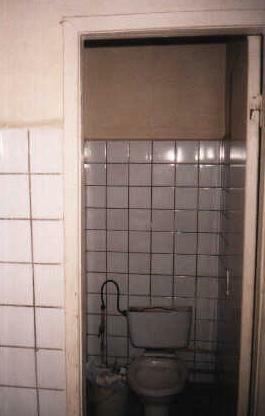 This toilet and shower are in one of the dormitory rooms. Notice the waste bin lined with a plastic bag. Russia is east of the Paper Curtain, so you put used toilet paper into the bin and you do not flush it down the toilet. You also see an overflowing bin beside the toilet below. There were no waste bins beside the toilets in the patient rooms in the hospital. I hope this is because the hospital was intentionally built with larger diameter plumbing and adequate flushing and drainage so paper could be safely flushed there. The all too possible alternative explanation is that the nursing staff found the task of emptying the waste bins too onerous and simply got rid of them, assuming that the system would work well enough to get by. 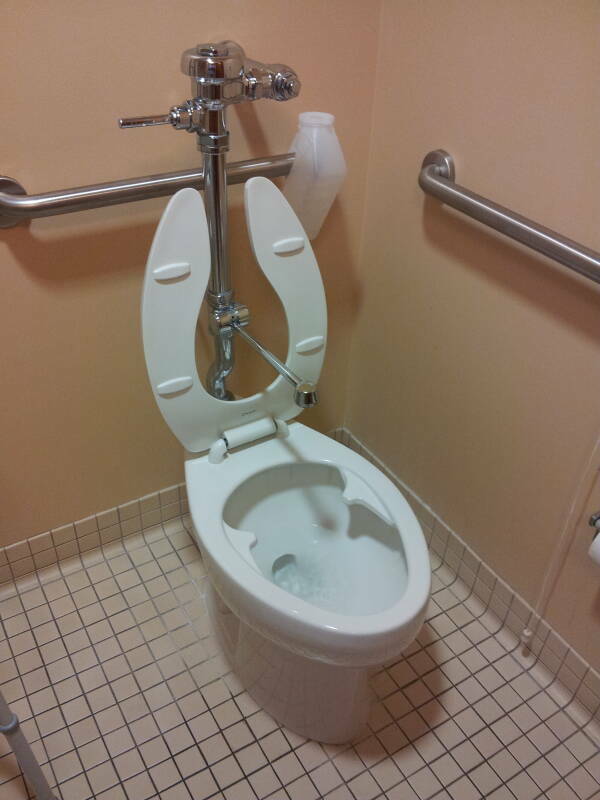 This toilet is in one of the staff areas at Hospital #122. Note the typical Russian lack of seat, overflowing waste bin, and faulty illumination. One day the head of the Louisvilniki, the group from the Louisville hospital, asked me to make an accurate floor plan of a hall which supposedly had been completely renovated. They weren't able to get a straight story from the Russians about how many rooms there were and what they were used for, even in just the one hall of the one floor of the kitchen. So off I went with Vlad the Translator, a clipboard, and a measuring tape. Most of the job was pretty straightforward. Fourteen patient rooms, some with a single bed, some with two, and a couple of four-bed wards. A preparation area where meals and medication could be organized. A rather cramped treatment room. The nurses' station at a T in the hall. And some storage areas. The nurses were no help. Vlad and I were just a bother, getting in the way of their naps and gossip. And our measuring around the end of the hall behind the folding screen where they had set up the nap bed seemed a bit threatening. So I demonstrated a key truth to Vlad: when you need to figure something out, involve the janitor or cleaning lady. They know where everything is, and they know about everything that happens. The cleaning lady was a lot of help, she could (and would) explain what each room was used for, and she had keys so we could make an accurate and complete floor plan. Wow, a whole room just for enemas! Well, let's have a look at this. It was one enormous room dedicated to enemas. About six by seven meters on a side, with a high ceiling. The floor and all the walls were covered in ceramic tiles with a central floor drain for easy cleaning. There was a large, elevated, bottomless Enema Chair positioned over the main drain. This brings up an advantage of Russian over English. In English the phrase "Big Enema Room" is ambiguous. Which is it? 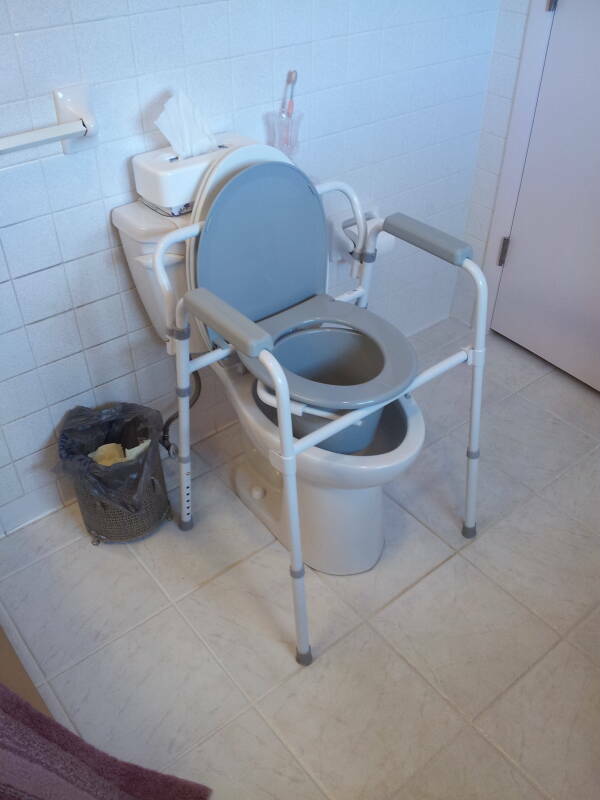 The "three-in-one" portable commode can, of course, be used in homes, along with bedpans and handheld urinals. See the dedicated page for details on using these systems at home.